"It wasn't life they couldn't give up, but hope. Jun-shik (JANG Dong-gun) is a young Korean man who dreams of becoming the next SOHN Ki-jung, the Korean gold medalist marathoner. Tatsuo (Joe ODAGIRI) is Japan's top marathoner. Sharing a strong sense of competition in childhood, Jun-shik and Tatsuo grow up to be the greatest of national rivals. A year after an unexpected incident sees Jun-shik impressed into Japanese military service, destiny reunites him with Tatsuo, now a colonel in the Japanese army. 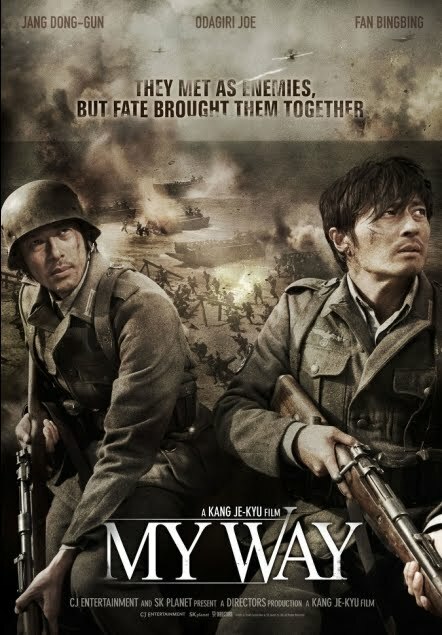 Thrown into the maelstrom of World War II, Jun-shik and Tatsuo wear the uniforms of Japan, the Soviet Union, and even Germany before finally arriving in Normandy, France. As they survive endless, unpredictable battles, they slowly transform into each other's greatest hope. A Korean man and a Japanese man meet as enemies, but become each other's hope. And a drama of true humanity that transcends borders and nationality unfolds" (Alternate Pictures).